It comes from a music journalist who will write a new biography for Simon & Schuster. Music journalist Paul Morley will write The Age of Bowie, a biography to be released later this year by Simon & Schuster’s Gallery Books. This is not some opportunistic money grab but rather part of a genuine response by Morley, who as he was asked again and again for his thoughts on the departed legend, felt it would take a book to properly contextualize the man, the artist. He was the human equivalent of a Google search, a portal through which you could step into an amazing, very different wider world. He flooded plain everyday reality with extraordinary, unexpected information, processing the details through a buoyant, mobile mind and made intellectual discovery seem incredibly glamorous. So true, especially that last part; Bowie really did make being smart seem cool. 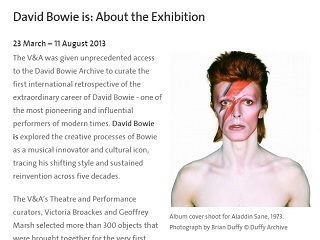 The exhibition ran from March 23 through Aug. 11 at the Victoria and Albert Museum.